Jeannine Oleksak, 83, of Warren, PA. died Monday, September 10, 2012 at 12:55 P.M. at the John and Orpha Blair Hospice Home after an extended illness. She was born October 14, 1928 in Oil City, PA. to the late Edward and Elizabeth Sanner McGraw. 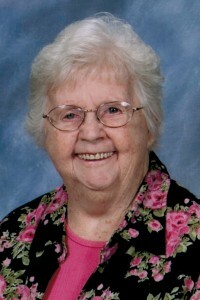 She was a resident of Warren for the past 65 years and was a 1946 graduate of St. Joseph High School of Oil City, PA. Jeannine was employed as a clerk at New Process Company, former Betty Lee Dress Shop and Levinson Brothers Department Store, she retired after 10 years employment at the Bon Ton Dept. Store. She was a member of St. Joseph R.C. Church. Jeannine always put her family first, where it was the center of her life, especially loved her grandchildren. She loved watching old movies. She is survived by her husband of 56 years, Anthony “Tony” J. Oleksak whom she married October 22, 1955 in Oil City, PA., 2 Daughters – Ann Oleksak Vizza and husband, Louie, Margaret Oleksak Lodowski and husband, Rick all of Warren, PA., 1 Sister – Carol Rudisille of Lancaster, OH., 1 Sister-in-law, Mary Catherine McGraw of Meadville, PA., 3 Grandchildren – Mollie (Adam) VanOre, Peter Vizza, Ricky Lodowski all of Warren, PA., several nieces and nephews. In addition to her parents, she was preceded in death by 2 Sisters – Mary Margaret O’Neil and her husband, Howard, Theresa Ann McIntyre and husband, Richard “Mac”, 1 Brother-in-law, Daniel Rudisille, 3 Brothers – Jack McGraw and wife, Rita, Francis McGraw and infant brother – Jimmy Lee McGraw. My thoughts and prayers go out to your family for your loss. I know what you’re going throught I lost my moyher a week ago also. Jeanine was a great lady, I enjoyed working with her at Betty Lee’s a few years ago. Again I’m sorry for your loss. My thoughts and prayers are with your family. I know what you are going through my mother past away a week ago. Your wife and mother was a great lady. I worked with her several years ago at Betty Lee’s. On behalf of my family, please accept our condolences for the passing of Mrs. Oleksak. will comfort you in the days ahead.